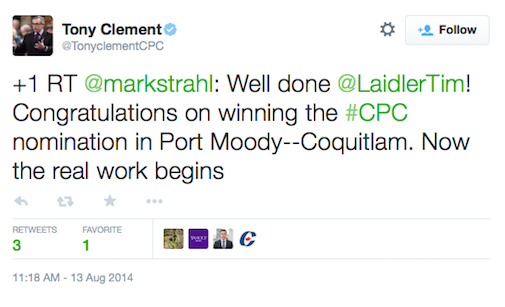 You are here: Home / Politics / Is this the Conservatives’ new youth strategy? 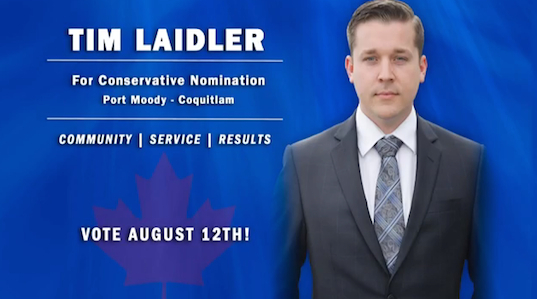 In researching Tim Laidler, the young Conservative candidate in my home riding of Port Moody-Coquitlam, I started to notice a remarkable number of repeated patterns and parallels between his social media feed and those of many other young Conservative candidates across the country. These patterns kept coming up again and again. 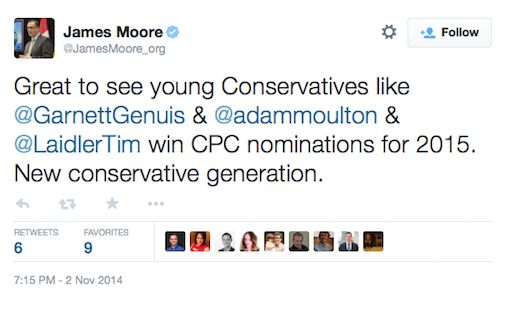 They included: (1) a considerable amount of social media interaction between young Conservative candidates from different regions, (2) an apparently disproportionate number of endorsements of these young candidates, prior to their nomination, from various sitting MPs and Conservative party brass, and (3) a large number of congratulations messages for these young candidates from sitting MPs following their nomination. I began to wonder, was everyone’s social circle really that broad? Or were there some connections between these young Conservative candidates and sitting MPs and party brass that were not immediately apparent? 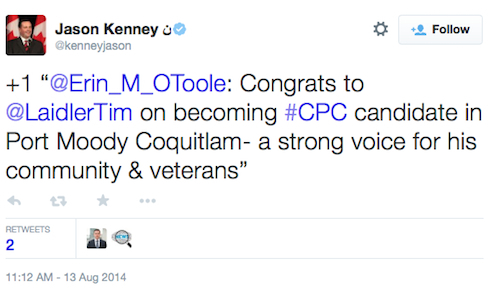 Interestingly, many of these young candidates seemed to somehow know each other, often tweeting congratulations directly to each other when they were nominated (below) and even more recently. What exactly was going on here? 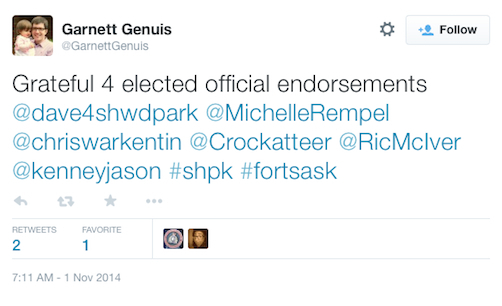 Could this all be part of some Conservative strategy for the next election? Could they be trying to appeal to the youth vote by putting forth as many young candidates as possible, in hopes that they would put them back into a majority position? The Conservatives were successful with a focused appeal to ethnic voters in the last election; could the same be happening again, this time by appealing to young voters? 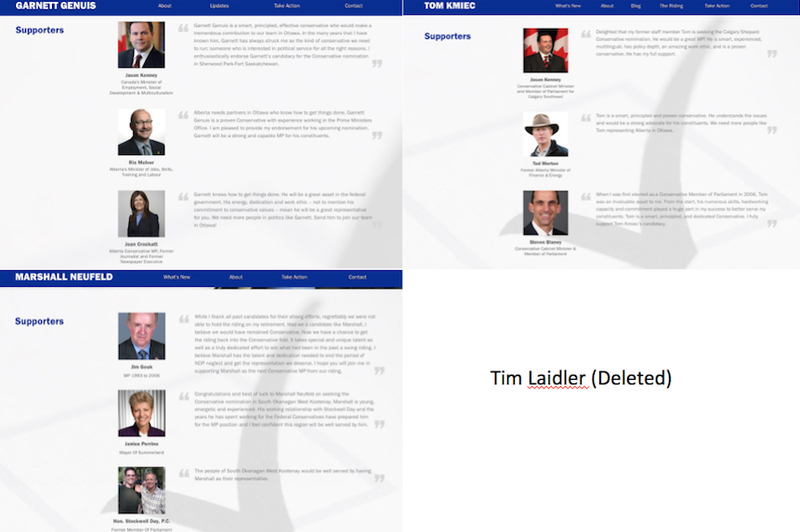 (Before going any further I must give a hat tip to Minister James Moore for providing me with the first list of the candidates for me to research and for giving me the idea for this blog post. That came from the tweet below). 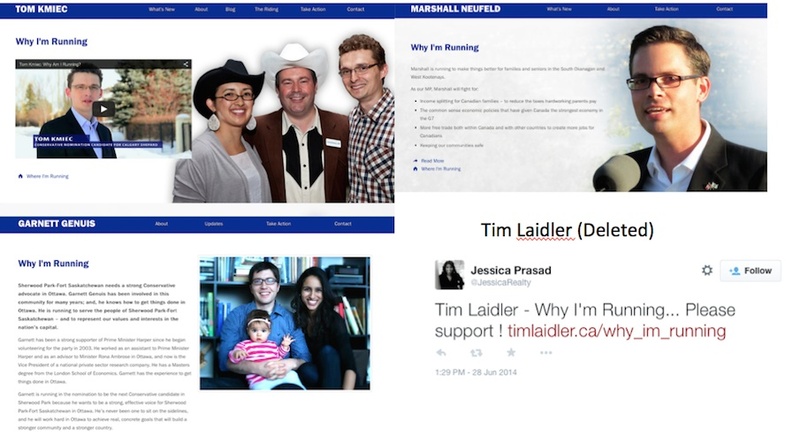 I began my investigation into this possible new strategy by looking at the websites and social media feeds of a number of young Conservative candidates, including Tim Laidler. I was quite frankly surprised by what I discovered. I ended up focusing primarily on three candidates and the nomination process within their ridings, and compared that to what took place in my local riding of Port Moody-Coquitlam. 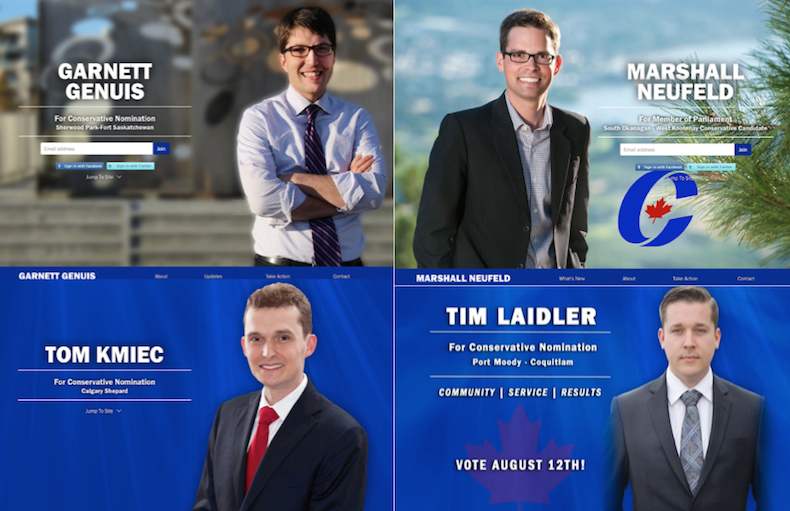 The candidates selected for comparison included: Tom Kmiec (the young Conservative Candidate for Calgary Shepard), Garnett Genuis (the young Conservative Candidate for Sherwood Park-Fort Saskatchewan), and Marshall Neufeld (the young Conservative Candidate for South Okanagan-West Kootenay). I then compared their social media accounts and nomination websites with what I could piece together for Laidler. What immediately jumped out at me (and will to you if you’ve already clicked on the links above) is, and was, the obvious similarity between the websites for all of these candidates, right down to the use of similar fonts, similar page names, similar information provided, size of graphics, format, etc. suggesting that a customizable template had been used for all of them. This also suggested some type of overriding, intra-riding outside influence. In addition, one tweet from July identifies the existence of a “Why I’m Running” section and the captured content from his site is remarkably reminiscent of the Bio Section of the other candidates’ webpage, including an apparent link to a supporters page. 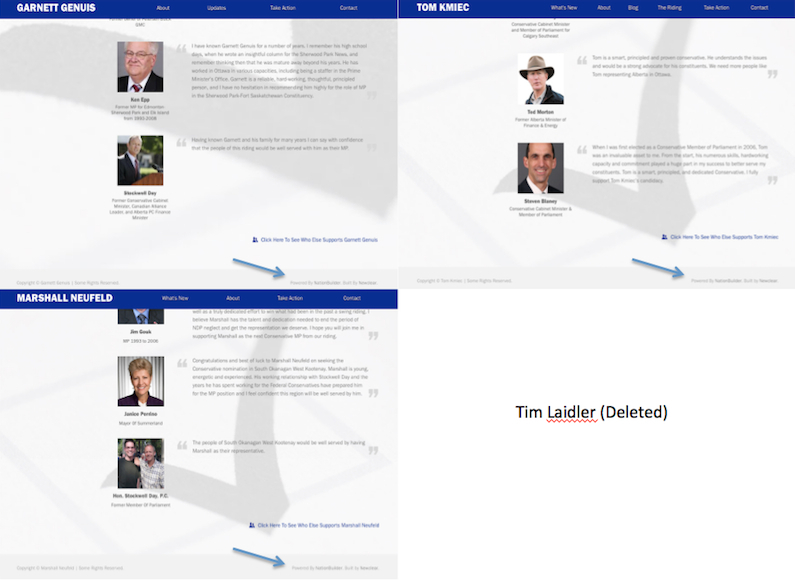 More than likely, Mr. Laidler’s page was generated from the same template as the others. Remember, these are websites that were created for the nomination races. So where exactly did this master template come from? The answer can be found at the bottom of the last remaining page of each one. Additional details concerning Go Newclear can be found here. 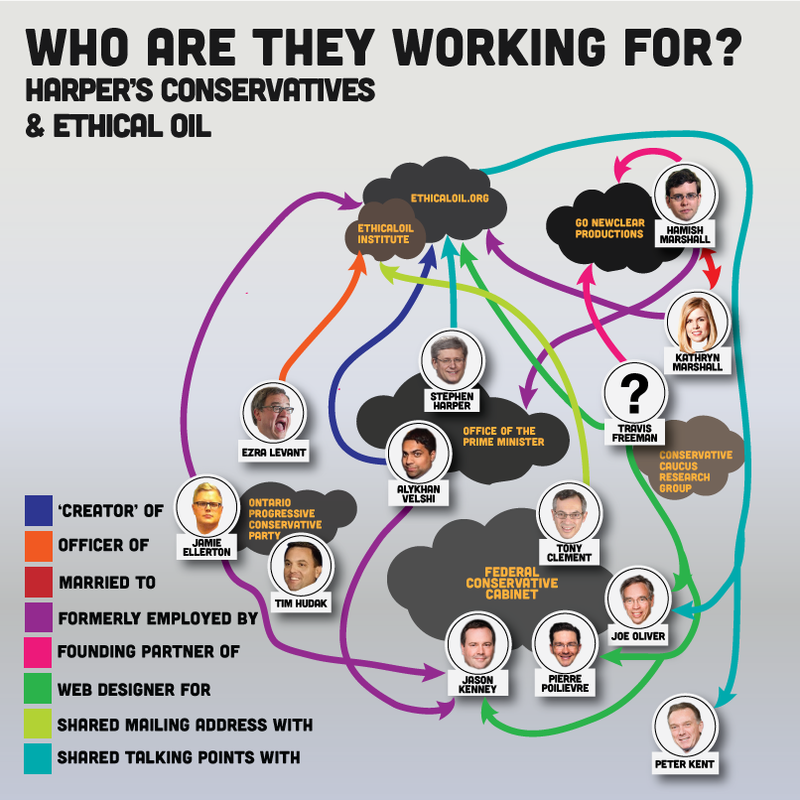 According to The Globe and Mail, Greenpeace says “Go Newclear productions created and host websites for Ethical Oil, and Conservative cabinet ministers Joe Oliver, Pierre Poilievre, and Jason Kenney.” In other words, the agency is linked to the highest echelons of the Conservative Party, if not directly to the Prime Minister’s Office itself. 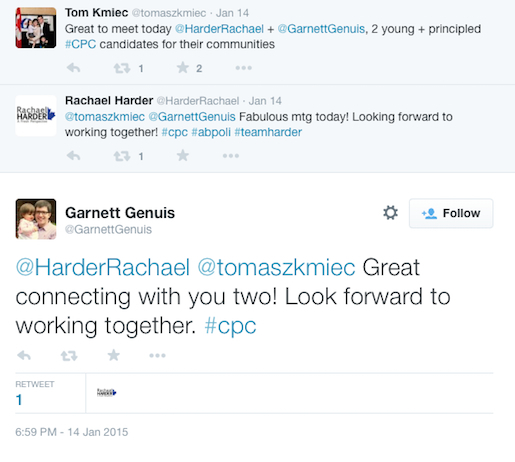 These clear connections suggest that Conservative Party brass in Ottawa are involved in the promotion of selected young candidates in certain ridings, possibly at the expense of other candidates, and that pursuit of the youth vote may be part of a focused campaign orchestrated at the national level. It seems apparent that, as with the previous effort to secure the ethnic vote, materials and a strategy have been made available to certain young (and perceived electable) candidates in key ridings. Laidler is a fraud. Wearing medals he is not entitled to and using money for his MA provided to the Veterans Transition Network that was to be used for injured Veterans. He was for sure not the founder of the program. What’s going on ?